Nyeri County is proud to host the second Universal Healthcare Coverage (UHC) conference , bringing together local and international health sector stakeholders, to discuss and strategize on how to deliver accessible, quality and affordable healthcare to all Kenyans. 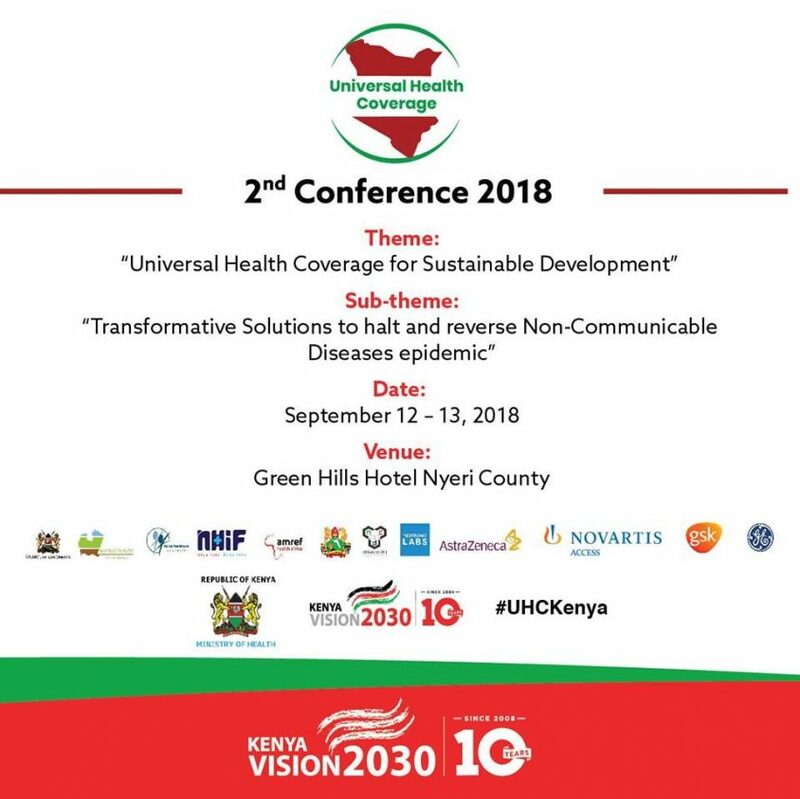 The three-day conference, slated for 12th and 13th September 2018 at Green Hills Hotel in Nyeri Town, comes hot on the heels of a successful inaugural UHC conference in Makueni County, earlier in the year. Under the theme, Universal Health Coverage for Sustainable Development, the conference will focus on seeking transformative solutions to halt and reverse the Non-Communicable Diseases (NCDs) epidemic at national level contributing to the national agenda of the “Big 4 Initiative” and Kenya’s Vision 2030. Non-communicable conditions such as cancers, diabetes, cardiovascular and mental health diseases are on the rise in the country and continue to pose threats and untold suffering to many Kenyan households. Universal health coverage is one of the government’s priority areas, under the Big Four Agenda, together with Food Security, manufacturing to deliver jobs for youth and affordable housing. The conference in Nyeri will also be an interdisciplinary platform that provides opportunities for stakeholders to discuss multi-sector approaches to addressing NCDs including: the role of private sector in accelerating treatment access, the role of government, civil society representing consumer in linking them with appropriate partnerships. According to a report released by the Ministry of Health National STEPwise 2015 survey, NCDs account for 27% of the total deaths and over 50% of the total hospital admissions in Kenya. The report further revealed that urbanisation, an ageing population, and adoption of unhealthy lifestyles that include poor diets, lack of exercise and excessive alcohol consumption are leading to growing prevalence of non-communicable conditions. Currently, NCDs cause over 63% of deaths globally, with 80% of these deaths occurring in developing countries. The World Health Organisation (WHO) estimates that NCDs will cause 73% of global deaths and 60% of disease burden by 2020. In Kenya, NCDs account for more than 50% of total hospital admissions and over 55% of hospital deaths. The Vision 2030 Delivery Board recognize that accessible, quality and affordable healthcare systems play an integral role in realisation of Kenya’s social goals as stipulated in the Constitution and the National Vision 2030. 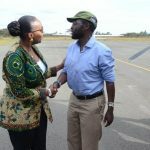 She was quick to warn on the increasing trend of non-communicable conditions in the country which if not arrested, would hamper achievement of the national UHC agenda. The Vision 2030 Social Pillar Director, Ms. Ada Mwangola underscored the need for stakeholders to forge towards realisation of Kenya Health Sector Strategic and Investment Plan (KHSS&IP) 2013-2017 and the Kenya National Strategy for Prevention and Control of NCDs (2015-2020) which is aligned to the government’s Big Four agenda, Vision 2030 and United Nations Sustainable Development Goals (SDGs). The second UHC conference is organized by the Kenya Vision 2030 Delivery Board in partnership with Ministry of Health, Amref Health Africa, Kenyatta University, Kenya Health Federation (KHF), General Electric (GE), and the Council of Governors. 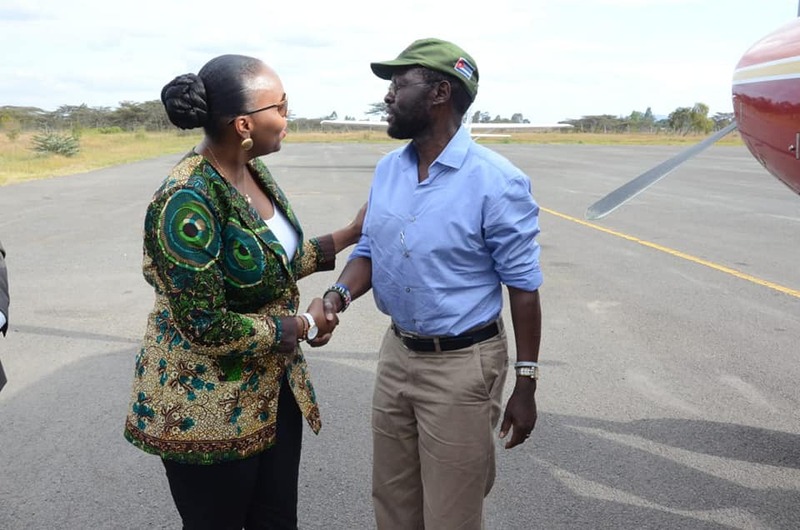 Other Dignitaries expected to grace the conference is Kisumu Governor H.E Anyang’ Nyong’o , who jetted into the county on Tuesday 11th September 2018 and received by Nyeri County Deputy Governor H.E Caroline Karugu. Kisumu County is among the four counties selected for the pilot phase in Offering Universal Health Care access to the people of Kenya for sustainable development together with Makueni and Isiolo Counties.